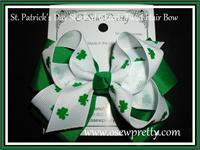 What better way to start your St. Patrick's Day celebration then with an Irish St. Patrick's Day hair bow! Good luck is sure to follow with our custom St Patrick's day shamrock ribbon and a special shamrock charm in the center. 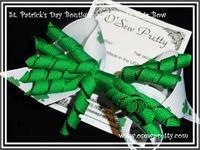 Stacked just right Shamrock ribbon creates this St. Patrick's Day hair bow. 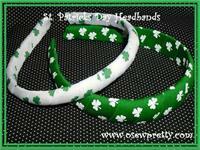 This is a comfortable padded headband wrapped in Shamrock ribbon that Mom's love to wear too! 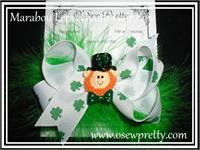 A Curly Corker hair bow fit for the Irish Princess! It's fit for the Irish Queen! It's a lucky little girl who gets to wear this Hair Bow! Available in four different Shamrock prints. 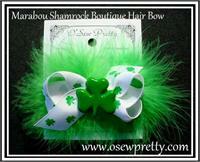 This St. Patrick's Day hair bow is stacked for extra fullness. 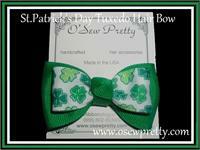 Her Irish eyes will smile when topped off with an O'Sew Pretty Irish bow! Made from our own custom shamrock ribbon stock, she'll feel lucky all day long. Top off your little leprechan with an Irish hair bow. The emerald green shamrock charm in the center adds just the right touch. 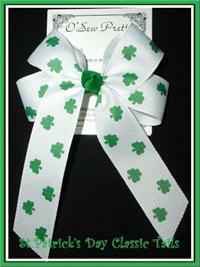 A classic Shamrock Print layered on a matching solid ribbon. Snown with optional monogrammed Initial. Choose our original Loops with tails hair bow for that look of a perfectly hand tied hair ribbon every time in just seconds. 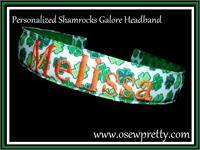 Choose from several irish prints and hair bow sizes to make just the lucky Irish headband. 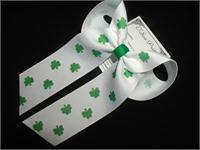 A classic Shamrock Print, layered on a matching solid ribbon. Shown with optional initial. 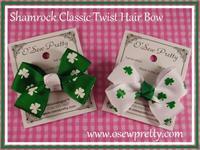 The Classic Collection designed with fun shamrock ribbon. 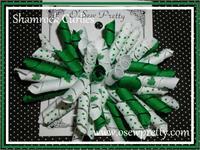 FOUR different Shamrock prints to choose from. Our smallest version of the boutique hair bow. 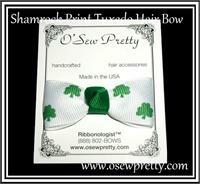 This perkey little bow is the perfect Irish accent. 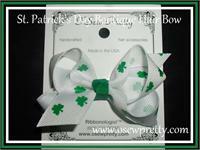 A simple but stylish hair bow made for St.Patrick's Day From your choice of ribbon. 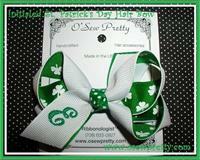 The "Classic" with a bit of a twist creates this St. Patrick's Day hair bow. 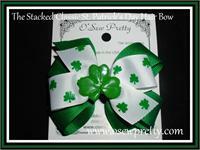 This is the perfect bow for the little leprechaun in your life. You can say " PINCH PROOF " with this unique style hair bow. Available in 4 colors. The perfect combination of style and comfort creates this personalized St. Patrick's Day. Choose from a 1' wide or 1 1/2" wide headband. 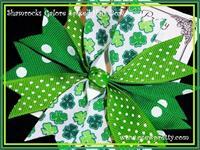 Lots of lucky shamrock ribbon spiked just right . Looks wonderful as a single hair bow and works great for piggy tails too. Wow! Your little Irish Princess will be quite peppy with this perfectly precious accessory. 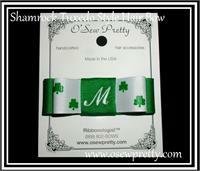 Shamrock print ribbon with curly ribbon accents. 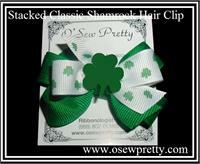 The "Picture Perfect" St. Patrick's Day Hair Bow! A wonderful combination of St. Patrick's Day green and accented with a emerald green button, monogrammed in a lime swirl initial . 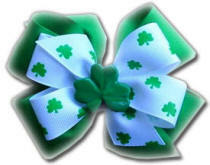 It" Time To Sparkle with this St. Patrick's Day Over the Top hair bow. A wonderful Girly Pink St. Patrick's Day hair bow accented with a monogrammed button in a your child's initial.